Just in time for the Easter holidays, the prices of fuel went up driving the cost of living further up. The news tonight is that the cost of another utility may likely hit consumers where it hurts the most; in their pockets. 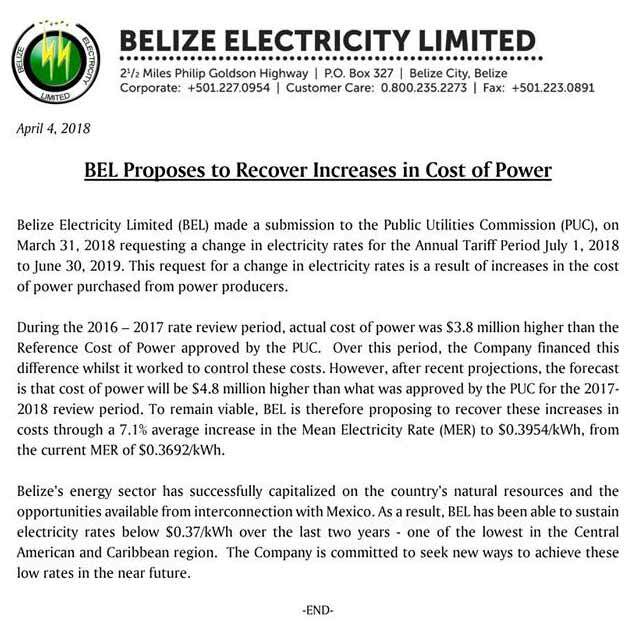 The Belize Electricity Limited says it has made a submission to the Public Utilities Commission requesting an increase in electricity rates for the Annual Tariff Period July first, 2018 to June thirtieth, 2019. B.E.L. says this is a result of increases in the cost of power purchased from power producers. In 2017 rate review period, B.E.L. spent three point eight million dollars more for power and recent projections show that the cost of power will be four point eight million dollars higher than what was approved by the PUC for the 2017-2018 period. The company is therefore proposing an increase of seven point one percent in the Mean Electricity Rate to thirty-nine cents per kilowatt hours.